Each fall, Bill Britt sets a theme for the upcoming year upon which we build our programs and ministries. The foundational theme for 2019 is “Hope in the Lord” and we can think of no better promise for the coming year. 2018 has been a wonderful year at Peachtree Road. We expanded our educational programs for young and old; we exceeded our Lenten offering goal as we raised money to reach out into the community with a helping hand; we welcomed new members to an already talented and vibrant ministerial and program staff; we have met to date our current financial needs; and we received pledges that will allow us to enter 2019 debt free. As we enter the final quarter of 2018, we truly have much for which we can be grateful, but we are not finished. If 2018 was good, with all the pieces we have put in place, imagine how far we can reach now. We should be entering 2019 full of HOPE. As Christians we talk about hope frequently, but we must remember hope is more than an experience or state of being. Hope is what happens when we put our faith into action in our congregation, our church, and our world. Hope is what others experience when we commit our lives and resources to God’s kingdom. 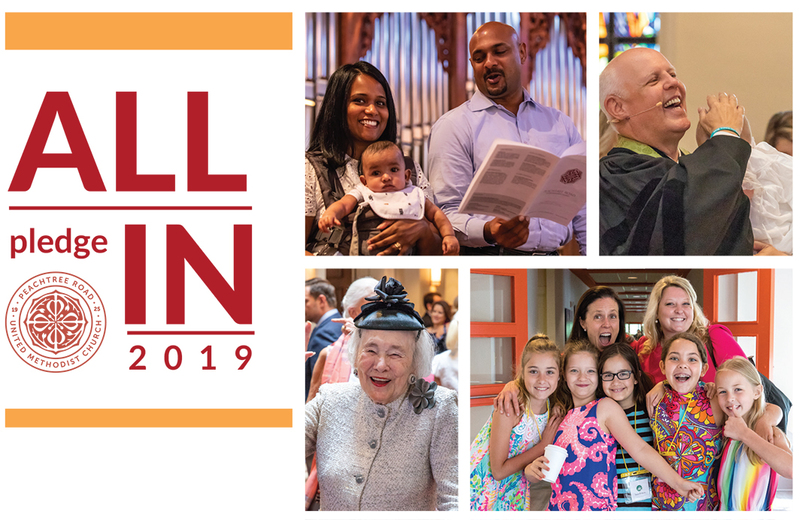 As we kick off our fall “All In” campaign, I hope you will prayerfully consider your “All In” contribution and pledge to the work we do at Peachtree Road. Join Cindy, me, and all of your Peachtree Road friends as we work to bring hope to others in our congregation and in a hurting world. Every pledge counts. Every gift makes a difference. I look forward to joining you at the end of our campaign as we celebrate and imagine together the difference we can make.